From historic cottages and converted farm buildings to contemporary hotels on the edge of the Interior, there’s a variety of interesting and unusual places for families to stay in ICELAND. All of our favourites listed below (listed in the order you’d encounter them on our Big Trip Iceland itinerary) are thoughtfully designed, have a distinct personality, warmly welcome children, and have that little extra something – home-baked cakes, geothermal hotpools in their grounds, a waterfall just out of the window – that will help your kids remember their visit to Iceland long after your trip has ended. They also have one other thing in common: location, location, location. For hotels in Reykjavík, that means a central setting, a short walk from the city’s museums and the harbourfront; outside the capital, we’ve picked places that make the most of Iceland’s sensational scenery. You can reserve all of our recommended places to stay in Iceland through Booking.com; clicking on the hotels’ name below will take you directly to their booking page, where you can fill in your dates and secure your stay. To find out more about why we’ve partnered with Booking.com, see here. 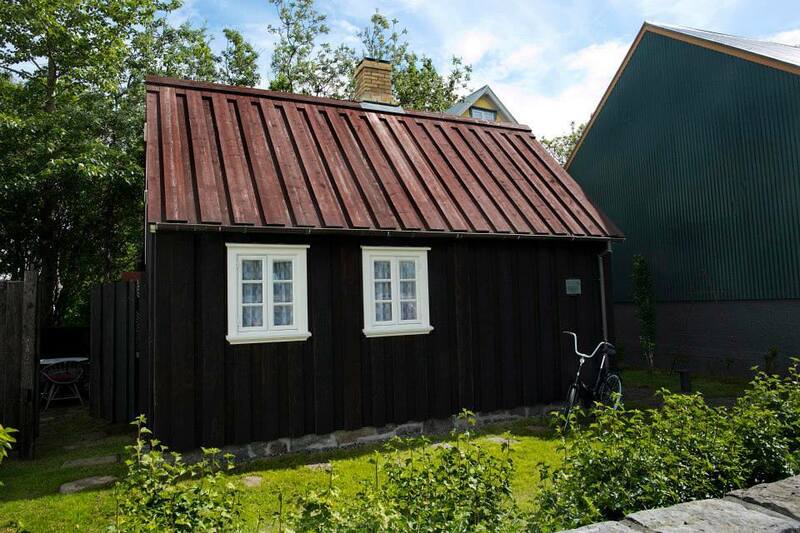 This lovely little wooden cottage is quite unlike anything else in Iceland. The former home of Reykjavík’s Watchman, who lived here whilst patrolling the capital’s streets in the mid-1850s, VAKTA HOUSE has been beautifully restored and makes a delightfully snug central stay – it’s set in a residential neighbourhood less than 5 minutes’ walk from the Settlement Exhibition and yet it’s blissfully quiet. A living room, fully equipped kitchen and bathroom make up the ground floor; in the quirky loft upstairs, there’s sleeping for four in a double bed, sofa bed and mattress, all with cosy goose-down duvets, though you’ll have to watch your head if you’re over 6ft. Cute touches like locally designed textiles and traditional toys in the little attic “playroom” lend it a homely feel, as does Margrét, the friendly owner, who has the fridge stocked with necessities ready for your arrival and is always on hand if needed. There’s an enclosed garden for outdoor dining, and bikes for cycling around town. Even better, a Citroen C3 is included in the rate, for day-trips outside of Reykjavík. Due to the steep stairs, Vakta House is not suitable for children under 5. Another central Reykjavík option, opposite the Parliament building and near tranquil Lake Tjörnin, but a very different offering. KVOSIN DOWNTOWN is a 24-room boutique hotel, set in a historic building but with modern accommodation that has been painstakingly furnished in minimalist Scandi style. The rooms are seriously spacious, with good-sized living areas, and kitchenettes with fridges and Nespresso coffee machines (though not kettles). The larger ones (Social Suites and Executive Suites) are great for families, sleeping between 4 and 6 people including the sofa bed – note that some of these family rooms are “open plan” in that their bedrooms don’t have any doors on them. Some rooms also have balconies. The hotel has its own trendy bar, Klaustur (Cloister), the location for breakfast (not included in the rates). The most striking hotel of this mini Icelandic chain, the contemporary FOSSHOTEL GLACIER LAGOON occupies an eye-catching wood-clad building a few hundred metres from the tiny hamlet of Hnappavellir. Conveniently located halfway between the major South Coast attractions of Jökulsárlón and Skaftafell, it’s just off the Ring Road but feels wild and remote, with the mountains that mark the start of the Vatnajökull ice cap on one side and the North Atlantic on the other. The high-ceilinged rooms are stylishly austere (rugs add a splash of colour) and have picture windows that frame the beautifully bleak landscape. Deluxe Rooms can sleep 3 in a double and a single (plus a cot if necessary); larger families will need to book two Standard Rooms. If you fancy a splurge, the restaurant offers an interesting selection of modern Icelandic dishes, but it’s expensive, even by Iceland’s standards (kids meals are half price, though), and you’ll probably need to book a table in advance, as there aren’t any other restaurants for miles. The bar does a simpler (and cheaper) menu of club sandwiches and the like, though. An extensive buffet breakfast is included in the rates. Ignore the name – “THE GARAGE” doesn’t do these imaginatively converted buildings on Iceland’s South Coast justice. They’re technically adjacent studio apartments, but that does little to denote their glorious location, on a windswept farm under the imposing Eyjafjallajökull ice cap, or their endearing appearance, either. Each one has a warm, rustic-chic interior and well-appointed kitchen, plus – a godsend in winter – a bathroom with heated floor. They can sleep 3 people in single beds, or (in the much larger ones) 4 in adjoining singles and a double sofa bed. It’s the personal touches that make this place, though. You’ll be greeted with a freshly baked cake, and more home-cooked goodies are often ready for your return at the end of a day’s sightseeing. Siggi and Anna, the hospitable owners who live next door, will take your kids on the daily egg collection or out to see their sheep. The farm is on the Ring Road, in Varmahlíð (not to be confused with the Varmahlíð in North West Iceland! ), between Skógafoss and Seljalandfoss. HOTEL RANGÁ is the most famous hotel in Iceland. It’s also one of the most expensive. But if you can afford it, a stay here is quite the experience. The hotel stands alone on an open, tufty-grassed expanse south of the Ring Road, in a great location just under 100km east of Reykjavík and, more conveniently for anyone touring South Iceland, 27km down the road from Seljalandsfoss waterfall. There are some slightly eccentric touches, like a stuffed polar bear (from Greenland) in the lobby and suites decorated with Native American headdresses, Masaai spears and other idiosyncratic artefacts, but it’s very well run, with extremely helpful staff, and the personable owner is normally on site – unusual for a hotel of its ilk. Deluxe rooms have a small sofabed, but families with more than one child will need to splash out on one of the continent-themed master suites, which will set you back a stiff-drink-inducing £775 a night. Most rooms come with Jacuzzi bathtubs and all enjoy tremendous views of the East Rangá river or Hekla volcano. Dinner in the restaurant is a fine-dining affair involving dishes like locally caught salmon and – if your children can ever forgive you – smoked puffin, but it does also have a good (and much cheaper) kids’ menu as well. Entertainment comes in the form of a pool table; steaming outdoor hot tubs, a great spot for watching the Northern Lights; and an observatory that’s home to the biggest telescope in Iceland. There are also dozens of activities on offer, from horse-riding to river rafting. Just remember to pack a credit card or two. Tucked away in the Borgarfjordur Valley, HOTEL HÚSAFELL stands in striking contrast to its surroundings, a sophisticated place in a landscape of brooding mountains and formidable glaciers. Its open design and floor-to-ceiling windows make the most of the vast scenery, though the rooms themselves feel comfortably cosy. Superior Deluxes, with their own terraces and huge bathrooms with shower and bath (bathtubs can be surprisingly hard to come by in Iceland), can sleep 4 with the use of a sofa bed, though even the Standard Rooms have enough space to take a rollaway bed and/or extra mattress. There’s also a pretty self-catering chalet, with rooms for up to 5 people, a 20-minute walk away. Food at the attractive restaurant is top notch (with prices to match), but you can also get pizza, pasta and salads at the nearby Húsafell Bistro (open until 9pm in summer) to balance your bills out. Tours of Langjökull Glacier depart from the hotel, and the Víðgelmir lava cave is just 15 minutes’ down the road, but there’s plenty to do around Húsafell itself. You can try one of the hotel’s hiking trails, several of which are easy enough for even the youngest member of the family; a couple can also be tackled on the hotel’s (free) mountain bikes. Or you can just relax in their inviting complex of thermally heated pools (also free) that, uniquely, includes a small slide. There’s also a children’s playground, with a jungle gym and trampoline. Húsafell makes a great spot for watching the Northern Lights in season (they average around three sightings a week here in winter), and you can even ask Reception for a wake-up call if they make an appearance in the middle of the night. 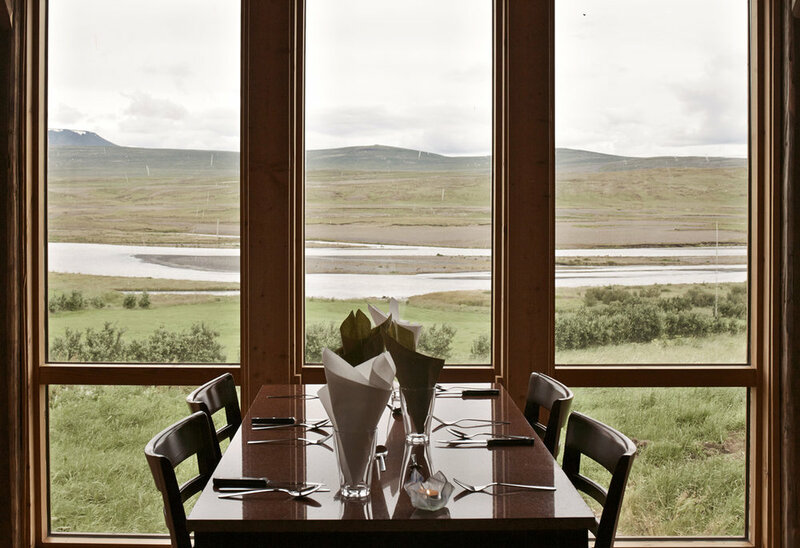 A pleasant (and cheaper) alternative to Hotel Húsafell, 11.5km to the east, family-run HOTEL Á has been atmospherically converted from old farm buildings and enjoys a beautiful setting near the Hvítá river. As they charmingly put it, their guests “eat in a barn and sleep in a cowshed”, but this is a very smart cowshed, furnished in pared-down Scandinavian style, but welcoming and toasty all the same. Family rooms have a double and a single bed (in a separate room), so you’ll need to book more rooms if you’re travelling with two or more children. Snuggle up in front of a roaring fire on the comfy lobby sofas before tucking into the good-value three-course set dinner, cooked and served by the owner and his son. Hotel Á is on Route 523, 17.5km northeast of Reykholt and also close to the 1km-wide Hraunfossar falls (5km away) and the lava tube at Víðgelmir (15km).